Whether you're writing a letter or entering numerical data, your keyboard is the main way to enter information into your computer. But did you know you can also use your keyboard to control your computer? Learning just a few simple keyboard commands (instructions to your computer) can help you work more efficiently. This article covers the basics of keyboard operation and gets you started with keyboard commands. Control keys. These keys are used alone or in combination with other keys to perform certain actions. The most frequently used control keys are CTRL, ALT, the Windows logo key , and ESC. 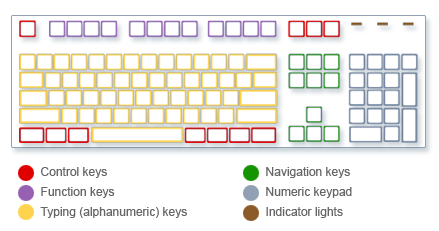 The following illustration shows how these keys are arranged on a typical keyboard. Your keyboard layout may differ. Whenever you need to type something in a program, e-mail message, or text box, you'll see a blinking vertical line. That's the cursor, also called the insertion point. It shows where the text that you type will begin. You can move the cursor by clicking in the desired location with the mouse, or by using the navigation keys (see the "Using navigation keys" section of this article). In addition to letters, numerals, punctuation marks, and symbols, the typing keys also include SHIFT, CAPS LOCK, the TAB key, ENTER, the SPACEBAR, and BACKSPACE. SHIFT Press SHIFT in combination with a letter to type an uppercase letter. Press SHIFT in combination with another key to type the symbol shown on the upper part of that key. Press CAPS LOCK once to type all letters as uppercase. Press CAPS LOCK again to turn this function off. Your keyboard may have a light indicating whether CAPS LOCK is on. Press the TAB key to move the cursor several spaces forward. You can also press the TAB key to move to the next text box on a form. 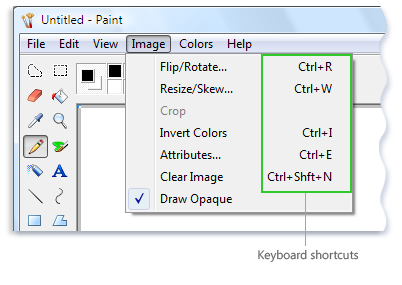 In Help topics, a plus sign (+) between two or more keys indicates that those keys should be pressed in combination. For example, CTRL+A means to press and hold CTRL and then press A. CTRL+SHIFT+A means to press and hold CTRL and SHIFT and then press A. You can open menus and choose commands and other options using your keyboard. When you press ALT in a program with menus, one letter in each of the menu names becomes underlined. 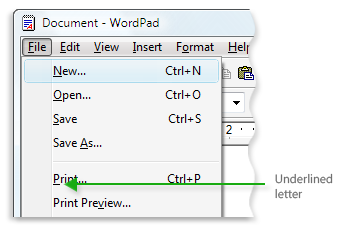 Press an underlined letter to open the corresponding menu. Press the underlined letter in a menu item to choose that command. The following table lists some of the most useful keyboard shortcuts. Open a menu of commands related to a selection in a program. Equivalent to right-clicking the selection. 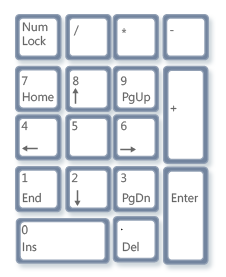 Open Calculator by clicking the Start button , clicking All Programs, clicking Accessories, and then clicking Calculator. So far, we've discussed almost every key you're likely to use. But for the truly inquisitive, let's explore the three most mysterious keys on the keyboard: PRINT SCREEN, SCROLL LOCK, and PAUSE/BREAK. A long time ago, this key actually did what it says—it sent the current screen of text to your printer. Nowadays, pressing PRINT SCREEN captures an image of your entire screen (a "screen shot") and copies it to the Clipboard in your computer's memory. From there you can paste it (CTRL+V) into Microsoft Paint or another program and, if you want, print it from that program. More obscure is SYS RQ, which shares the key with PRINT SCREEN on some keyboards. Historically, SYS RQ was designed to be a "system request," but this command is not enabled in Windows. Press ALT+PRINT SCREEN to capture an image of just the active window, instead of the entire screen.